There are 5000+ known security vulnerabilities in Python dependencies. Any of these can cause a major security breach in your own code. Manually tracking and updating dependencies is a full time job, and it only takes one missed GitHub email to have a security breach. 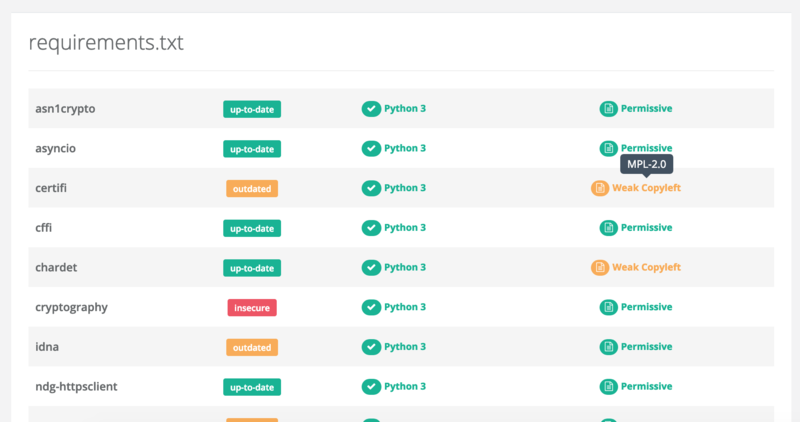 PyUp tracks over 173,000 Python dependencies for vulnerabilities, so that you don't have to. Never deploy known vulnerabilities again, and be confident that new vulnerabilities will be automatically fixed. PyUp maintains a comprehensive database of known vulnerabilities. We actively track over 173,000 Python dependencies. This is updated in real time, as soon as a new vulnerabilities are logged. PyUp scans your dependency files for insecure or outdated requirements. Our scanners were built to solve for complex Python environments and are highly configurable to your needs. PyUp fits into your workflow. 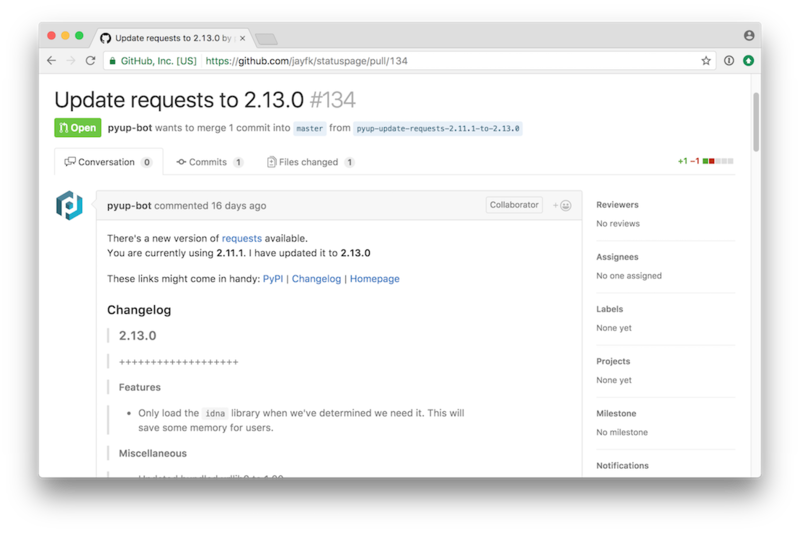 Get automated pull request fixes in GitHub, use our Safety CI to catch vulnerabilities before code reaches production, or integrate our command line tools into your CI workflows. PyUp scans private and public Python depedencies for updates, vulnerabilities, Python 3 support and OSS licenses. We track and categorize new vulnerability disclosures as they happen so you don't have to. Don't be left with insecure packages. PyUp can open PRs for dependencies that have updates. Get a PR as updates are released, or batch updates daily, weekly or monthly. PyUp scans and lists the OSS licenses of each of your dependencies. Never worry again about using a dependency with a license that isn't compliant with your teams' needs. PyUp fits into your workflow. From fully automated pull requests in Github to safety command line tools and APIs, we have excatly what works for your team and codebase. PyUp can automatically open PRs to update dependency versions. This can be customized to happen as they come, or batched daily, weekly or monthly. You can set this to only update security updates, and can customize which dependency files to track and which version ranges to consider for each dependency. 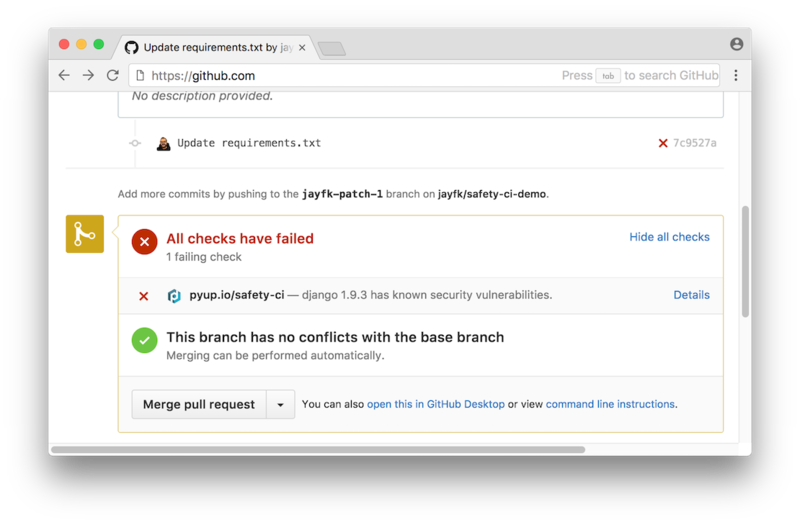 PyUp's Safety CI integrates with GitHub and will scan all new branches and pull requests for vulnerabilties. This way you can keep your code secure and be aware of problems before they hit production. PyUp fits easily into your CI pipeline. For example, it returns a non-zero exit status if it finds a vulnerability. Run it before or after your tests. If Safety finds something, your tests will fail. Read more about Safety's command line tool options on GitHub. PyUp's command line tools allow you to customize and build the perfect workflow for your needs. Safety CLI scans your local repository's dependency files and reports on security vulnerabilities. It is highly configurable to scan the files you want, and give the output that works for your workflow. Read more about Safety CLI on GitHub. The PyUp CLI can update the dependencies in your GitHub or GitLab repository directly from the command line. Learn more about PyUp CLI on GitHub. docker build -t safety-docker . The container can be used just as described in the examples README section. A pull requests triggers the integrations you have set up on your GitHub repo. Run CI tests automatically or post a message to the team's favored chat channel. pyupio/pyup - The pull request bot running on pyup.io. pyupio/safety-db - A database of insecure Python packages. pyupio/safety - The Safety command line tool. pyupio/changelogs - A changelog finder and parser. pyupio/dparse - A parser for Python dependency files.